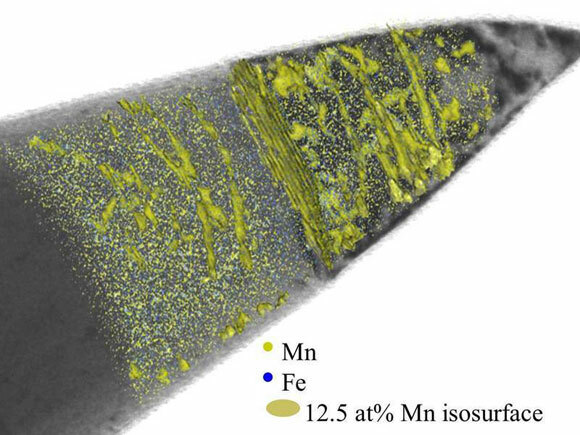 Structural change in steel: Scientists at the Max-Planck-Institute use images from a transmission electron microscope (grey) to make linear defects in an alloy of iron (Fe) and manganese (Mn) visible. Atom probe tomography shows them the distribution of the iron (blue) and manganese atoms (green). They have put green iso-surfaces into the image where the concentration of the manganese atoms is 12.5 percent. In the superimposed images, the researchers can see that the manganese atoms accumulate along the linear defects; the crystal structure which forms there is different to the surrounding material. Scientists at the Max Planck Institute reveal that the crystal structure of metals can change at linear defects, which should affect the properties of the materials. Steel has already been around for roughly 3000 years and in several thousand variations today – yet it is always good for a surprise. Scientists at the Max-Planck-Institute für Eisenforschung in Düsseldorf have now made a discovery in manganese steel which is thought to affect the properties of the material for good and bad. They have found out that the alloy forms a different crystal structure at linear defects than is typical for the material. The individual crystal grains of which any metal is composed can be considered as a stack of individual atomic layers. Linear defects, or more precisely edge dislocations, occur when a layer remains incomplete so that the layers above and below it must take a step. As the length of the linear defects in a cubic meter of steel can add up to one light year, the discovery ought to have great practical significance since the structure of a steel depends on, among other factors, how malleable, rigid and ductile it is – properties which material scientists want to continuously optimize. “We stumbled across the states more by chance,” says Dierk Raabe. He and his team had been investigating the micro- and nano-structure of a particularly rigid and ductile manganese steel which is strengthened with the aid of nanoparticles and is used in the landing gear of large aircraft, for example. They analyzed this material with the aid of atom probe tomography. The analysis involves a sample being vaporized atom by atom with short pulses of an electric voltage. From the time-of-flight to a detector it is possible to determine to which element the vaporized detached atom belongs; its position in the sample can be determined from the location where the atom impinges on the detector. “We noticed that the concentration of the manganese increased along specific lines after we had heated the material,” explains Dirk Ponge, who made important contributions to the study. The fine tubes in which the manganese collects are only two nanometers wide. And this happens not along the whole length, but more in the form of a chain of manganese-rich nano-beads. In order to accommodate the larger number of manganese atoms in these minute areas, the crystal structure of the material must change. Iron and manganese atoms normally sit at the corners and centers of a cubic unit cell, the smallest structural unit. The researchers call this a body-centered cubic or martensite structure. The manganese concentration in the chain of nano-beads corresponds to an arrangement in which the atoms are located on each face and corner of the unit cell, in technical terms, a face-centered cubic or austenite structure. The fact that the atoms arrange themselves differently from the remaining crystal precisely along the dislocations is also suggested by an explanation of the observation: “The stress is particularly high at the dislocations,” says Dirk Ponge. “The material can apparently reduce stress and thus assume an energetically more favorable state by forming a crystal structure there which would be energetically less favorable otherwise.” On the basis of this finding, the Düsseldorf-based researchers extended a key formula that material scientists use to calculate which structure a material favors under which conditions at such structural defects. The researchers now want to investigate what effect the local structural change has on the properties of a material. “Our findings may help to explain an already known behavior of metals – the fact, for instance, that metals become brittle when they corrode and absorb hydrogen,” says Dierk Raabe. 1 Comment on "Scientists Discover Structural Change in Manganese Steel"
Does Martensite not have a body centred tetragonal structure?